The magazine Mobil started in 1995 and continues to be the leading publication for consumers interested in the latest regarding mobile phones, tablets, apps and accessories. 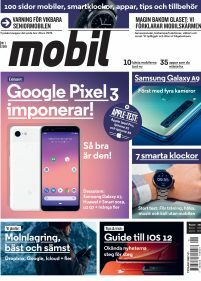 Mobil magazine and the website mobil.se, online since 1997, is the go-to destination for reviews, news, useful how-to guides and behind the scenes articles from the mobile industry. In a competitive market Mobil is and has been the market leader since the launch and today the areas covered has expanded to the evolving mobile industry including wearables and other types of connected devices. In Mobil magazine the readers can always be sure to get the latest news, reviews of all new devices along with useful guidance on how to get the most out of the device they already own, regardless of what operating system and device type chosen. Apart from the many consumers depending on Mobil for advice on what devices to buy and what apps to use many resellers as well as business readers use Mobil to stay updated and be sure to make the right decisions. Det känns som Xiaomi siktar in sig på Garmin med sin klocka Amazfit Stratos. Den når inte upp till Garmins nivå men kan ändå vara den billiga träningsklocka du letat efter. Batteritiden imponerar i Urbanears första over ear-lurar. En app känns som ett naturligt nästa steg för sjukvårdens distanstjänst, men det här är inte den appen.